This installment of the Star Log.EM-series clocks in at 8 pages, 1 page front cover, 1 page editorial, 3 pages of SRD, leaving us with 3 pages of content, so let’s take a look! 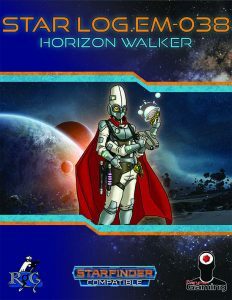 After the by now traditional contextualization of the material within in the Xa-Osoro system, we are introduced to the rendition of the horizon walker classic, for SFRPG, which comes in this iteration as an archetype. The archetype grants the favored horizons ability at 2nd level, which ties into the favored biome ranger methodology from the Starfarer’s Companion. It should be noted that this ability is NOT reprinted herein, which means you NEED to have the Starfarer’s Companion. Indeed, the archetype is tied pretty strongly to the ranger class from that book, and rangers may take the biome mastery ranger methodology 4 levels earlier and don’t take the indicated -4 penalty to class level for prerequisite purposes. At 4th, 6th, 9th, 12th and 18th level, the aforementioned class feature allows you to gain the favored biome ranger methodology or biome mastery ability as though granted by the archetype, though you still have to meet prerequisites, if any. Biome mastery, as noted, is learned at 4th level and whenever a replacement class feature is gained, with save DCs, if any, equal to 10 + ½ class level + key ability score modifier. At 4th level,a atotal of 10 such biome masteries are available, and they include gaining a supernatural fly speedequal to land speed, with the option of improving maneuverability or speed of a pre-existing fly speed. Much to my chagrin, the ability does not note the maneuverability of the base fly speed granted by this mastery. Aquatic biome offers for a swim speed and longer holding your breath, with similar speed improvement caveats. Desert biome mastery fortifies you versus temperatures and exhausting/fatiguing effects. Forest mastery lets you slip, Stealth and Acrobatics through undergrowth and helps your KAC versus grapple in these places. Hills and mountains acclimate you to high altitudes and net you climb speed; marsh helps navigate bogs and swamps, even the really nasty ones, and yields a bonus to disease and poison. There also would be masteries for subterranean and urban environments, and yes, even vacuum. All of these build mechanically on the respective favored terrain ranger methodology to take them, as they often apply the bonus bestowed by that ability to other values. Biome training is an exception here, allowing allies to temporarily benefit from biome ranger methodologies as long as they remain close. At 8th level, biome jaunt is added to the list of masteries that may be chosen – it’s basically a Resolve-powered dimension door in the biome. At 14th level, an additional two masteries are provided, with one being a straight upgrade of aforementioned jaunt that allows you to bring allies along. Reactive biome jaunt is different. While in the favored terrain and when targeted by a spell or attack, you can spend 1 Resolve Point as an immediate action…wait. Wut? There are no immediate actions in SFRPG. Oh, and the ability is based on competing Reflex saves to see if you short-range teleport out of the way. So…yeah. Not a fan. The pdf also contains two new ranger methodologies, both of which are unlocked at 8th level for the taking – Biome Combatant lets you apply studied target to all creatures native in a whole biome instead, rather than specific targets. This is a bit weird, since studied target lasts until the target is dead, you study a new target, etc., which basically takes away the move action required in combat to study as well. Not a fan. Biome Mastery allows a ranger to get one of the aforementioned horizon walker biome masteries, but at -4 class level…unless, as noted before, the ranger also is a horizon walker. Editing and formatting are good on a formal and rules language level. While I noticed missed spell-italicizations and the aforementioned glitch trashes an ability, the pdf as a whole is precise and solid. The artwork provided is solid, and the pdf has no bookmarks, but needs none at this level. I am not a big fan of Alexander Augunas’ horizon walker, to say the least. I am not overtly fond of the base concept in the first place. From the design perspective, I enjoyed the general structuring of the biome mastery angle, but the masteries themselves oscillate somewhat in their potency. I like the idea of the superb survivor, but not reprinting ranger abilities you need is a bit of a let-down, particularly since, personally, I don’t allow the Starfarer’s Companion’s legacy classes unanimously in my game. All in all, I consider this to be a decent offering – nowhere near as cool as what the author cranks out with an astonishing regularity, but also not exactly bad. If you absolutely want the concept of the horizon walker in your games, this’ll do the trick, but personally, I prefer almost every Star Log.EM installment over this one. My final verdict will clock in at 2.5 stars, rounded up due to in dubio pro reo. Missed the Starfarer’s Companion? You can find it here!